Departing from a lacklustre and disappointing first season of Little Busters, Key manages to produce an emotionally powerful number with Little Busters Refrain. As many people were saddened with the inability for Little Busters to maintain a steady footing due to it's hit-or-miss arcs, I was glad I survived first 26 episodes to experience a full circle moment and follow a wonderful story with Little Busters Refrain. A mini review/ refresher what the first season entails: Riki Naoe scouts for members at school to expand their existing 5 membered group called the Little Busters to create a 10 membered baseball team. 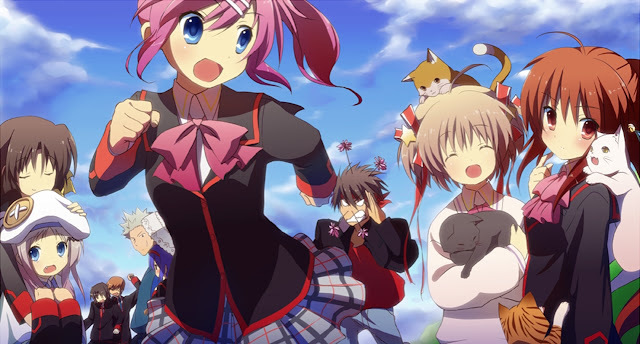 With the exception of Riki and Kyousuke Natsume, the story followed the arcs of each individual member of the Little Busters. From what I remembered only Haruka Saigusa, Kudryavka Noumi, Komari Kamikita and Mio Nishizono arcs were displayed in the first season. With only Haruka and Kudryayka's storylines being somewhat interesting to me, the first season of Little Busters became very slow, and hard to watch due to the hit-or-miss storylines of these four girls. I basically lost hope right from the get go with Komari's storyline when she balled over a dead stray cat, and right after came Mio's slow/ eyelid shutting storyline which failed to impact me in anyway. And as a result, my image of the highly praised Refrain began to tarnish. Thankfully Kudryayka's and Haruka's arcs in the end sort of saved the reputation of Refrain for me. So if you've seen the first season, clearly the anime pictures a story about friendship and companionship when your friends come face-to-face with their issues. Refrain is able to take that motif of friendship, and take it to another level to mirror the power of true friendship to ones you probably share with your best friends. Right from the first episode we dive into another Little Buster arc which happens to be Yuiko Kurugaya. After watching the first episode I was like, "wow this episode was way better than the first 26 episodes." The first episode was able to deliver a powerful and meaningful message about friendship that pulled my heartstrings to it's ends. Over the next few episodes we follow Masato Inohara and Kengo Miyazawa's arcs which were not too bad. One of the main differences between Little Busters and Little Busters Refrain is that Refrain actually has a goal it sets out and accomplishes. And that goal is painted out by the the intellect of Kyousuke and his ideals reflected for Rin Natsume's arc, which happens to be the final arc as well. Within the final few episodes, the buildup with all the different arcs between the members of the Little Busters come full circle and serve a purpose for Rin's storyline to showcase a strong message about friendship as well as coming of age. Many people claimed they have shed a "tear" during the final episodes of the anime, unfortunately I did not. Yes the ending of Refrain was emotional but not to the point where tear ducts started to water. Although the first season of Little Busters was a bit bland for me, I have to say that the music and OST was amazing in itself. If I'm correct I assume that the original OST was used in Refrain as well. Not much to note in this department since I enjoyed the music as mush as I enjoyed some of my personal greatest anime OST hits like Aria. Slow Curve and Song for Friends were probably my favourite tracks to listen to and were memorable/ noticeable when it played in the back. In terms of animation there was a huge improvement from Little Busters to Little Busters Refrain. I remember during Komari's arc in the first season, seeing the poorly done animation of the rain plus other minor animation flaws that sort of bugged me. However besides from the plot and contributing to the overall improvement of Refrain was the animation. First episode when Kurugaya smashed the door and pieces of wood flew everywhere (first gif) I was in awe of the beauty of the animation and the crystal clear and crisp animation continued out until the final moments of Refrain. Good job there Key! Overall I'm quite pleased with the fact that I got through Little Busters to witness Refrain. With the exception of the first episode, the first half of refrain was lukewarm; the magic of refrain really starts halfway into the anime and the beauty of Little Busters Refrain is really magnified within the last 2 episodes of the anime. A powerful story about friendship and growing up, it's an anime anyone can relate to. If you've seen the first season and was disappointed with the outcome, Refrain might be able to cure that sore reputation you had of the first season. Anyways....that's it for this review, if you've made it up to this far into the review fell free to tell me your thoughts about Little Busters Refrain or my review for this anime! Thanks again.